Aerobelt has been contracted for the new ship loading facility at Rio Tinto’s Cape Lambert project. The work was carried out in two stages, the phase A and phase B projects. Phase B of the project was supplied in early 2014, installed and commissioned in September 2014, and both systems are now fully operational. Rio Tinto needed a method of checking the quality of the iron ore being shipped overseas and samples had to be taken every few minutes until the ship was fully loaded. The conveyors were designed to have a speed range of 0.4m/s to 2.24m/s to stretch the material prior to the sample being taken. Each conveyor was fitted with one or two Hawke infrared detection units, as some conveyors were reversing. This function was used to discharge any reject material from the system prior to taking the next sample. The conveyors were required to have the reliability and performance to run 24 hours a day to load the ships and take samples every 90 seconds while the ship was being loaded. Visit the company website to read how Aerobelt can design and supply conveyor systems for your business. 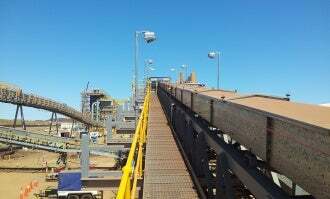 Image: Aerobelt designed and supplied ship loading sampling system conveyors for Rio Tinto. Photo: courtesy of Aerobelt.